Home MTAANI NEWS Man, 50 sets self ablaze over domestic dispute. Medical personnel at Mt. Sinai Hospital transferring Josephat Ndung'u to Kenyatta National Hospital after he set himself ablaze at his home on Saturday following some domestic disagreements. A 50 year-old man has set himself ablaze inside his apartment in Landless Estate Thika West Sub-County over a longstanding domestic dispute. The incident took place yesterday (Saturday) at around noon. The man, identified as Josephat Ndung'u aka ‘Kanyi arts’, is alleged to have been frustrated by years of misunderstanding with his wife that he drenched his body in kerosene and set fire on himself. Info gathered from neighbours alleged that that the man had accused his wife of infidelity. They told the press that had vowed to kill himself when his wife’s behaviour and hardheadedness became too unbearable for him. “We were attracted to the scene of the incident following smoke emanating from the apartment. We broke into the compound and rushed to salvage the situation. While all this was going on, he kept on shouting at the top of his voice that no one should rescue him and that he wants to kill himself,” narrated one of his neighbours. Through their efforts of area residents and the fire fighters from ICT College, they managed to put off the infernal before it consumed the whole house. The victim, who was alone in the house at the moment, was rushed to Mt. Sinai Hospital in Makongeni Estate where doctors administered some emergency First Aid before referring him to Kenyatta National Hospital as his condition was severe. “We received a call from the area community policing team and made arrangements to have him rushed to the hospital. The doctor says that he has about 41% burns and needs specialised treatment at Kenyatta National Hospital,” said Edwin Gitau Kibe, a representative of the area MP Eng. 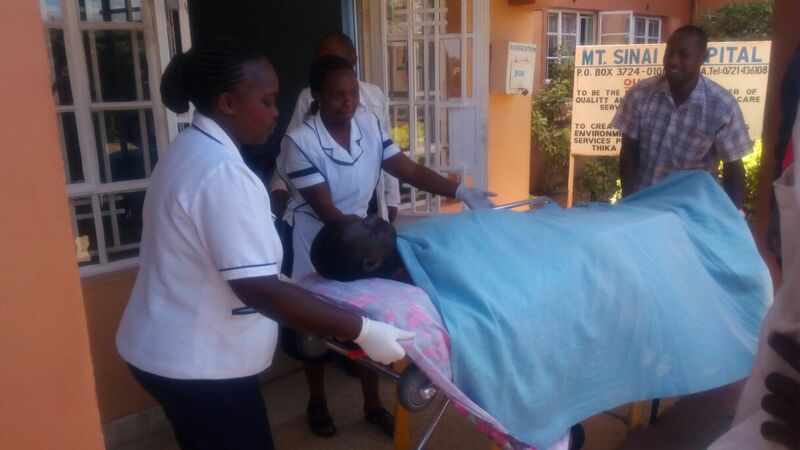 Patrick Wainaina, as they were transferring the victim to KNH. In an interview with the press, the area Community Policing Chairman Paul Njomo Thome blamed the incident to neglect of the boy-child by the society. Citing the numerous cases across the country where domestic disputes were resulting in the deaths of either spouses, Njomo said that there has emerged a very big gap in the raising of the boy-child, something that had left men vulnerable to domestic disputes due to indecision. “Even though the vigorous campaign to empower the girl-child and women as a whole has born fruits, the society has ignored the plight of boy-child. The boy child, man, husband and father are ignored and ending up suffering in silence. What we have witnessed here today is evidence enough that this man has been suffering in silence, with no one to come to his rescue,” said Njomo. He noted that the empowering of women had led to men being left feeling powerless in their homes. “The consequences of this is that the young men are left to find their own paths. This causes them to be stressed and resort to drugs and alcohol to deal with their stress. No wonder some men are being beaten by their women,” he said. Recognising the family unit as the basic unit of any society, Njomo reckons that its condition will determine the condition of the people it brings up and also the state of our leaders. “The man is key to any family. He has a role that cannot be taken by a woman because God designed it that way. It is therefore imperative that we take good care of our boys,” he said. The area Assistant Chief Mary Njaci appealed to families to seek assistance from elders and counsellors in the event they were entangled in recurrent disputes instead of resorting to life threatening actions.